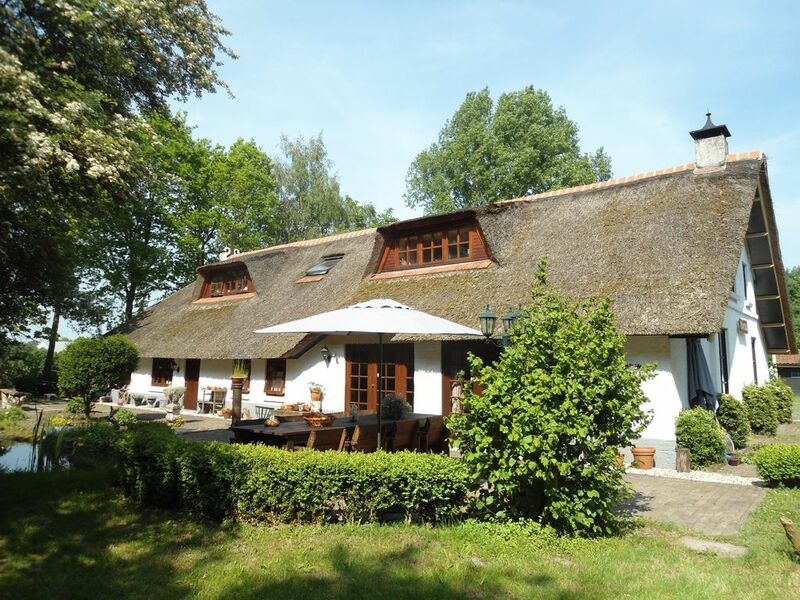 This beautiful thatched house and large garden is ideal for a lovely holiday for two or more families up to 16 people. In consultation can sleep more people and there may be placed cots. The house is secluded and has plenty of space in and around the house. Total approx 400 m2 of living space on two floors with large living room with fireplace, music corner, modern kitchen, large bathroom with Jacuzzi and separate shower and toilet, 2nd bathroom with shower and sink, separate 2nd and 3rd toilet and seven separate bedrooms with fixed beds . Large yard with shed, garden shed, trampoline, table tennis and table football. Large garden with patio, pond and woodland. Possibility of horse or pony riding by appointment. Very central location in the north of the Netherlands. A great home for your family reunion or happy holidays. Come enjoy the peace and quiet in this lovely holiday! You have the house and garden all to yourselves. There are no other inmates. Travel possible on Friday or Monday for a midweek, weekend or whole week. The main bathroom is spacious and luxurious with jacuzzi and separate shower, possibly also wheelchair accessible. The bathrooms and toilets are both on the ground floor. Upstairs on the landing there is a double sink and a toilet, In two downstairs bedrooms also has its own sink. Lots of space in and around the house. In the living room a music corner with electric piano and drums. Digital television with many Dutch, Belgian, English and German channels. Trampoline (safely buried) in the garden. Always somewhere the sun in the garden! Large outdoor swimming pool 6 km. Appelscha and indoor swimming pool 2 km. Oosterwolde. It is a charming home in a wonderful setting. It has a cozy environment that is very family friendly. The owner was very good to work with. We were visiting from the western US and felt very welcome. We would do it again! A wonderful place we called home for 8 days. Fantastisk ophold i et skønt sommerhus. signalet til tv'et kunne være bedre. Det er et meget spændende hus – der mangler ikke noget. Held og lykke med fortsatte udlejninger. Også vore to hunde havde glæde ved opholdet. De bolterede sig fint på den store plæne og lidt i markerne rundt omkring huset. Også en stor tak til naboen - meget hjælpsom. Thank you family Voigt for your nice words. Zeer ruim gezelig huis met een heerlijk grote tuin. Good busvoorzieningen to towns in the region. Railway station in Assen about 30 km and Wolvega approximately 23 km. Bijkomende kosten : Eindschoonmaak : 125,-- Euro Huisdieren 25,-- per huisdier (maxm. 2 huisdieren) Borg : 150,-- Euro Roken in het huis is niet toegestaan. Toeristenbelasting 1,-- Euro per persoon per nacht Speciale tarieven Pasen, Hemelvaartsdag, Pinksteren, meivakantie, Kerst, Oud en Nieuw Linnenpakketten te huur (optioneel) voor 7,-- Euro per persoon Linnenpakket inclusief handdoeken voor 10,-- Euro per persoon Bedlinnen en handdoeken mogen naar eigen keuze ook zelf meegenomen Homeaway vraagt u bij boeking een servicekostenfee te betalen via creditcard. Boekingsbedragen met alle verdere bijkomende kosten rechtstreeks aan ons te betalen. U krijgt van ons na boeking een boekingsbevestiging met alle benodigde informatie.